Die drei Entwicklungsökonomen Hans-Heinrich Bass (Bremen), Robert Kappel (Hamburg/Berlin) und Karl Wohlmuth (Bremen) haben im Auftrag der Friedrich-Ebert-Stiftung (FES) Tunesien eine Studie zu den Ansatzpunkten einer nationalen Beschäftigungsstrategie für Tunesien verfasst. Angesichts der wachsenden Arbeitslosigkeit und der Ineffektivität der nationalen Beschäftigungspolitik in Tunesien sind Impulse für eine Neuorientierung in der derzeitigen Entwicklungsphase des Landes besonders wichtig (vgl. dazu die Links zur FES Tunesien: http://library.fes.de/pdf-files/iez/12921.pdf und zur digitalen Bibliothek der FES: http://www.fes.de/cgi-bin/gbv.cgi?id=12921&ty=pdf ). „Wirtschaftliche Probleme und soziale Ungerechtigkeiten lösten im Jahr 2011 die Revolution in Tunesien aus. Seither hat sich viel in Tunesien getan; die demokratische Entwicklung des Landes wird international gelobt. Doch wirtschaftliche Reformen wurden bislang kaum unternommen. Insbesondere junge Tunesier_innen und Bewohner_innen des Landesinneren warten noch immer auf eine wirtschaftliche und soziale »Dividende« der Revolution. Ohne neue Impulse in der Beschäftigungspolitik gerät der politische Prozess in Tunesien in Gefahr. Die beste Form, um langfristige soziale Gerechtigkeit und gesellschaftliche Stabilität zu erreichen, ist durch gute, würdige und fair entlohnte Arbeit. 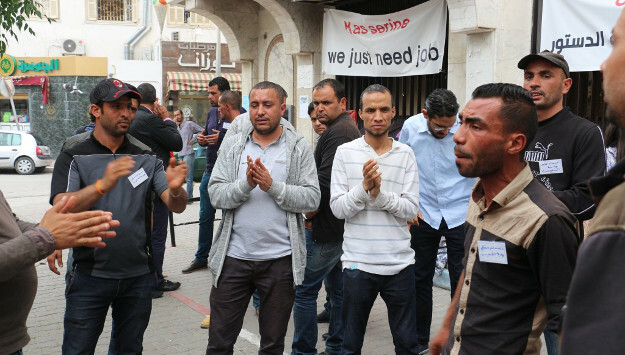 In Tunesien herrscht jedoch schon seit langem Unterbeschäftigung und der Anteil prekärer Jobs nimmt rasch zu. Viele Hochschul- und Berufsschulabsolvent_innen finden keine adäquaten Jobs, wohingegen viele andere im stetig wachsenden informellen Sektor tätig sind. Aus diesem Grund braucht Tunesien dringend eine neue Industriepolitik und eine umfassende Beschäftigungsstrategie. Erstens werden in der Studie Grundlagen einer kohärenten, inklusiven und nachhaltigen Wirtschafts- und Sozialpolitik für Tunesien vorgestellt. Dabei kommen der Privatsektor-Entwicklung und dem inklusiven Wachstum besondere Bedeutung zu. Die Dynamik in urbanen Zentren ist für die Beschäftigungsschaffung und für ein inklusives Wachstum stärker zu nutzen. Eine neue Industriepolitik kann inklusives Wachstum und Beschäftigungsschaffung unterstützen. Kleine und mittlere Unternehmen müssen anders als bisher offensiv gefördert werden. Zweitens legt die Studie dar, dass die Integration Tunesiens in globale und regionale Wertschöpfungsketten durch wirtschafts- und handelspolitische Maßnahmen deutlich verbessert werden kann. Ein großes Beschäftigungspotential einer vertieften Integration ist erkennbar. Allerdings sind industriepolitische Voraussetzungen für eine erfolgreiche globale und regionale Integration erst noch zu schaffen. Die einseitige und enge Konzentration in sektoraler und geographischer Hinsicht ist zu überwinden. Drittens zeigt die Studie, dass Auswege aus der Beschäftigungskrise möglich sind, wenn durch eine nationale Beschäftigungsstrategie die fehlende Dynamik der Arbeitsmärkte korrigiert wird. Aber auch ein neues Management der De-Industrialisierung ist notwendig, weil in den letzten Jahren viele Jobs im Sektor der verarbeitenden Industrie verloren gegangen sind. Die Beschäftigungskrise kann überwunden werden, wenn eine neue Industriepolitik die Möglichkeiten der Reindustrialisierung ausschöpft. Die Beschäftigungsschaffung in Tunesien kann durch vier Pfade der Reindustrialisierung voran gebracht werden. Schließlich sind aber Ausrichtung und Umsetzung der Beschäftigungsstrategie als gesamtgesellschaftliche Aufgabe zu verstehen; alle Stakeholder des Beschäftigungssystems müssen beteiligt werden, um einen Erfolg zu ermöglichen. Die Studie wird derzeit ins Französische und ins Arabische übersetzt. 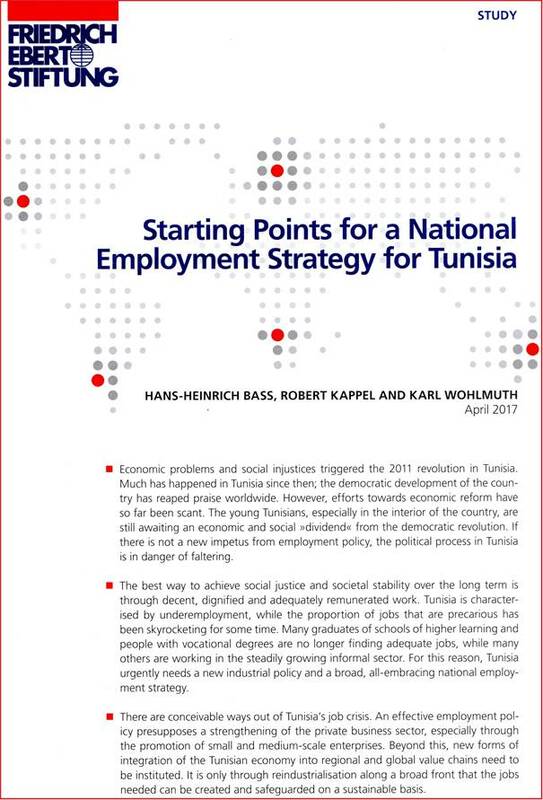 In a new Research Report Professor Karl Wohlmuth outlines Elements of a New Employment Strategy for Tunisia. The Report is a Background Paper for a Consultancy Study on Approaches to initiate a National Employment Strategy for Tunisia. 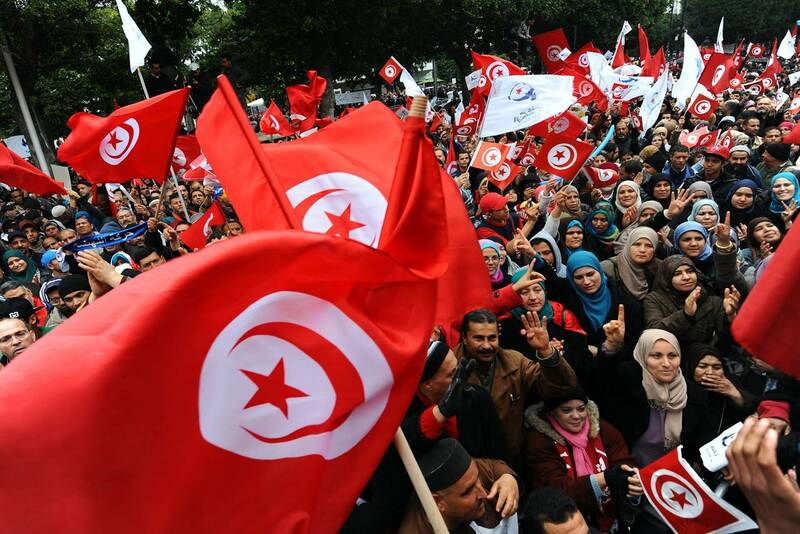 Tunisia is five years after the Arab Spring Revolution in the process of reforming its development model and especially so its employment policy and the related institutions. High overall unemployment rates and high unemployment rates among the graduates of tertiary and vocational education institutions reveal that the economy is not absorbing adequately its skilled labour force. In demand is in Tunisia unskilled labour and low skilled labour as these groups of the labour force have much smaller unemployment rates. The production system is since decades biased towards sectors, activities and processes which require low skilled and cheap labour. The reasons are that Tunisia has managed rather badly its deindustrialization process, the decline of the manufacturing share in GDP and the decline of the manufacturing share in overall employment. Improving the management of deindustrialization would require that the labour market and investment laws and regulations are adapted, that the STI (Science, Technology and Innovation) system is adjusted, that the tertiary and vocational education systems are reformed, and that the social security system is streamlined. Intentions to reform the development model and its institutions are there, but the political process prevents concrete actions. Also, in order to increase the demand for skilled people who are unemployed or working under precarious conditions, the country needs to initiate a reindustrialization process. In the Research Report four paths of reindustrialization are discussed and contrasted: First, reindustrialization via the promotion of competitive value chains in other economic sectors than manufacturing (agriculture, services, mining, etc.) is a promising route which could create a great number of jobs. Obviously, the sector policies are not employment-promoting. Second, reindustrialization via exploiting the potential for manufacturing in remote regions of the country (as manufacturing is largely concentrated in some coastal regions) is another viable option. Regional development incentives have obviously not worked towards creating employment in manufacturing sectors through a new inter-regional division of labour. Third, reindustrialization via new forms of integration into global value chains is a further important option. Tunisia has a large number of scientists and researchers and around 700 science, research & development institutions, but does not exploit this potential for global value chains which put to use the skills base and the research potential of the country. Fourth, Tunisia has great opportunities to reindustrialize via the development of “green growth industries” as the protection of its natural resources is important for sustainable development. In various environment-sensitive sectors employment can be generated through “green growth initiatives”. Examples are areas such as organic agriculture, ecotourism and sustainable tourism, sustainable construction, and a better management of solid waste. 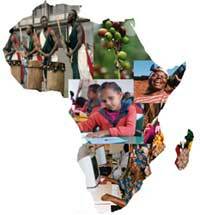 All these areas offer a lot of opportunities up to new value chains and an increase in the demand for skills. The Research Report is a Background Study, being part of a Joint Consultancy Contract. It is expected that short and long versions of the study can be published soon. 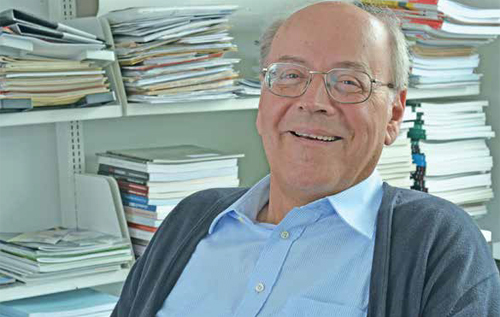 The study relates also to the ongoing work on economic reforms in Tunisia by Karl Wohlmuth (see Publications Wohlmuth and STI Policies Tunisia: http://www.karl-wohlmuth.de/sti_policies_tunisia/ ). 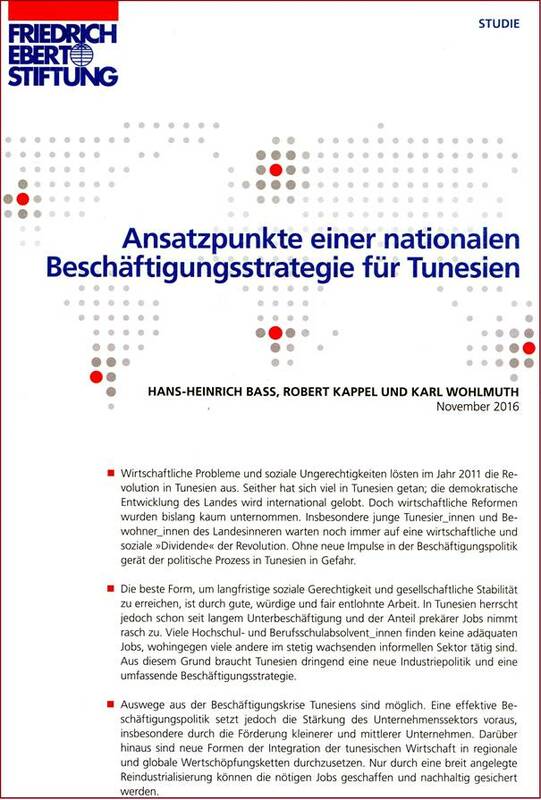 Wohlmuth, Karl, 2016, Ansatzpunkte einer nationalen Beschäftigungsstrategie für Tunesien (Orientations for a New Employment Strategy for Tunisia), Teil 1 (Part 1): Management von De-Industrialisierung und Initiierung von Politiken der Reindustrialisierung (Management of Deindustrialization and Initiation of Policies at Reindustrialization), Forschungsbericht im Ökonomische Reformen in Tunesien-Projekt (Research Report in the Project Economic Reforms in Tunisia), diverse Lang- und Kurzfassungen des Forschungsberichts werden veröffentlicht (various long and short versions of the Research Report will be published soon), Manuskript (Manuscript), 45 Seiten (pages), unveröffentlichter Text (unpublished text), erscheint im Dezember 2016 als Nummer 127 der Blauen Discussion Papers Reihe des IWIM der Universität Bremen (forthcoming as Number 127 of the Blue Series Discussion Papers, IWIM, University of Bremen, 45 pages, December 2016), unter dem Titel/under the title: Das Management der De-Industrialisierung und die Initiierung von Politiken der Reindustrialisierung. Elemente einer nationalen Beschäftigungsstrategie für Tunesien (The Management of De-Industrialization and the Initiation of Policies for Reindustrialization. 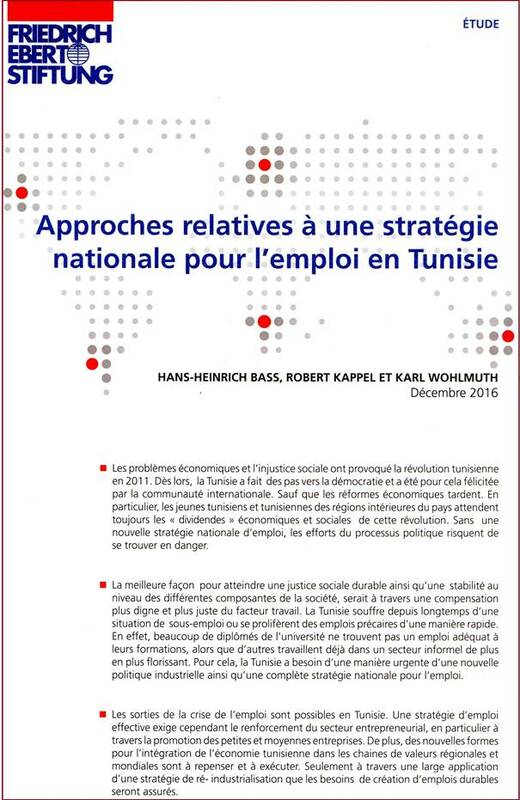 Elements of a National Employment Strategy for Tunisia). 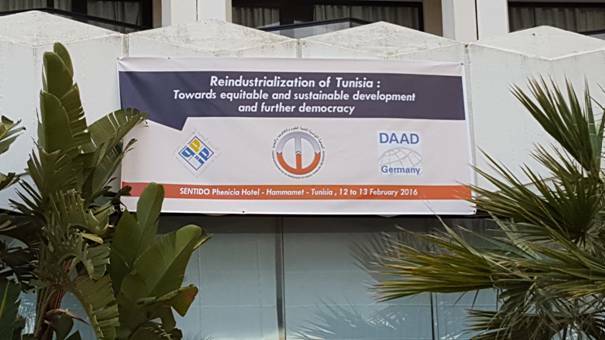 The Conference on “Reindustrialization of Tunisia” in Hammamet, which was organized by our Tunisian partners ENIT and TAASTI in Tunis, was a success (see the Programme PDF ReindusConf-Booklet and the Abstracts PDF Wohlmuth-Abstracts). The DAAD has financed the participation of eight researchers from Bremen, mainly from the University of Bremen. 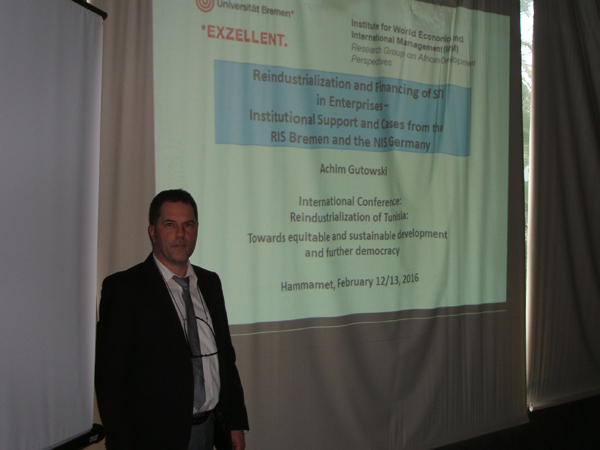 The theme of “Reindustrialization of Tunisia” was discussed by Tunisian and German economists. Also representatives of Tunisian Ministries, Employers Federations, Private Businesses and NGOs were invited as speakers. The whole conference was recorded by the TAASTI team so as to have lecture material for the ETP Master course at ENIT in Tunis. As the employment situation is quite serious in Tunisia, especially so the situation of the youth and of the academic and vocational training graduates, the discussion about reindustrialization and employment generation options was timely. The Conference started with a panel discussion. 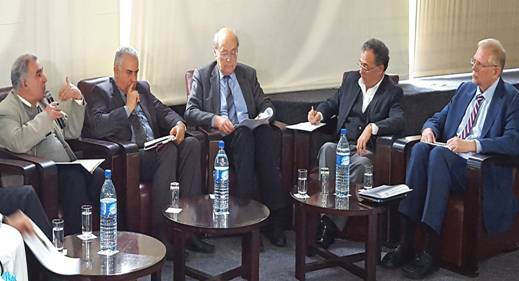 The panellists, among them Professor Karl Wohlmuth from the University of Bremen and Professor Hans-Heinrich Bass from the University of Applied Sciences Bremen, discussed about the “Role of Science, Technology and Innovation (STI) for Reindustrialization in Tunisia”. Professor Karl Wohlmuth emphasized ten key global industrial megatrends, as industrial development is shaped by strong global driving forces, such as digitalization, miniaturization, multi-faceted globalization, deeper forms of global value chain networking, intelligent (smart) specialization, use and spread of green technologies, industrial production through new technologies for saving resources, recycling and reusing materials, adapting to diversified and rapidly changing consumer preferences, and new forms of flexible production and labour use. 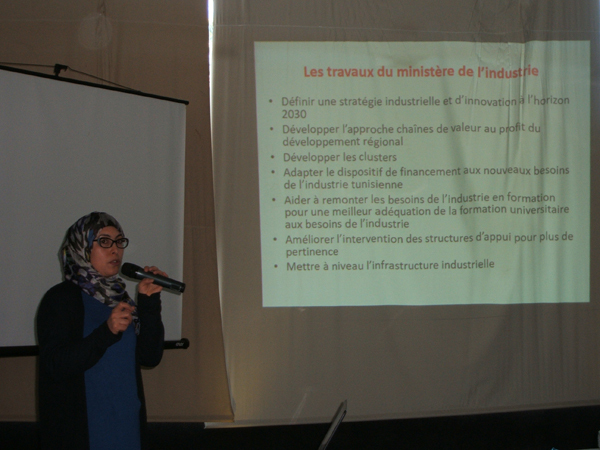 A representative from the Ministry of Industry spoke about new industrial policy initiatives in Tunisia. Although the Ministry of Industry has in some industrial policy areas a lead role, many other Ministries and Agencies have a say on industrial development. Therefore, Policy Forums were considered as important so as to address the inter-sectoral issues of Reindustrialization in Tunisia. The professors from the Research Group on African Development Perspectives Bremen gave presentations on key Reindustrialization issues. 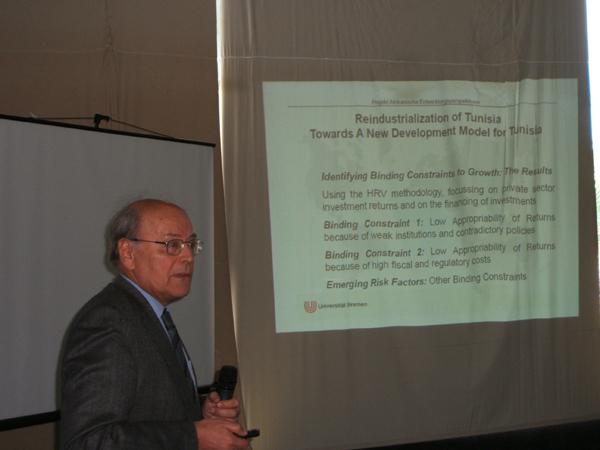 Professor Karl Wohlmuth gave two presentations. In the first presentation he discussed the causes of deindustrialization in Tunisia and the various options for reindustrialization; a new strategy for industrial development has to be based on pro-active STI policies (see the PDF Wohlmuth-Tunis-2). In the second presentation Professor Wohlmuth made proposals for the establishment of STI Policy Forums for guiding the reindustrialization process in Tunisia (see the PDF Wohlmuth-STI Policy Forum). Professor Hans-Heinrich Bass gave a presentation on “Strengthening the Role of Global Value Chains for a Successful Reindustrialization Process in Tunisia”; as Tunisia has lost in economic complexity in recent years; new approaches are needed to reverse this trend. 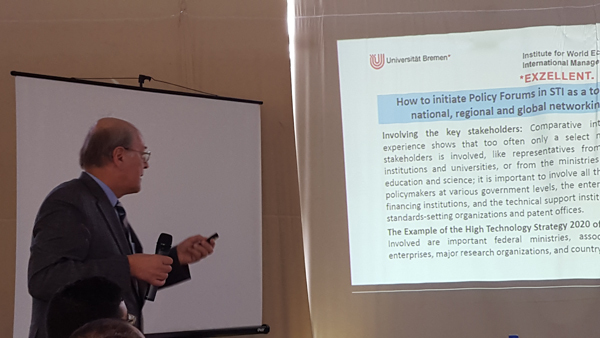 Professor Achim Gutowski, ISS Hamburg/IWIM Bremen, spoke about “Financing Innovations in Tunisia and Germany”; as Tunisia has a financing gap in industrial innovations of the private sector, there is great interest in the modes how Germany is promoting innovation financing. All over the conference sessions there was a lively discussion. For the Master students of the ETP programme at ENIT in Tunis a Foresight Analysis course was held as a closing session of the conference (financed by DAAD). New instruments of foresight analyses were presented as well as results from foresight studies concerning future global industrial development patterns. A major outcome of the conference in Hammamet was the insight that Tunisia has to overcome the development model inherited form Ben Ali so as to solve the major economic and social problems. Five years after the Revolution this task is not achieved. The Conference Lectures started with a speech by Professor Karl Wohlmuth, Director of the Research Group on African Development Perspectives, IWIM, University of Bremen, Germany. 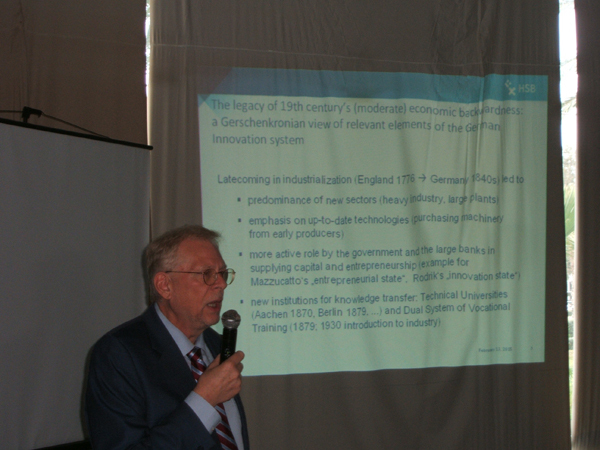 He introduced in his presentation the theme “Deindustrialization, Reindustrialization and the Contribution of Coherent Industry and STI Policies: What are the Tasks ahead for Tunisia?”. 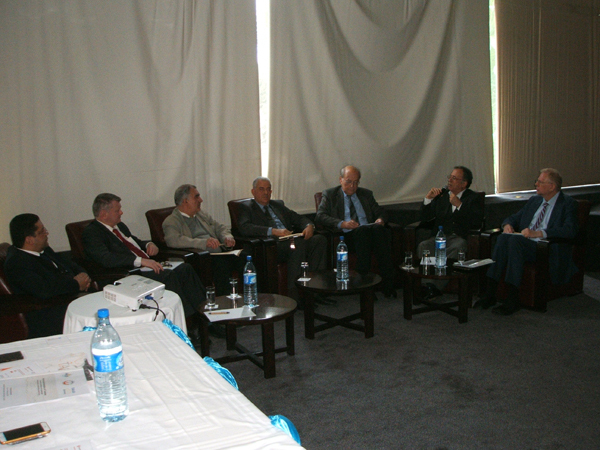 In his presentation he considered key issues of Tunisia’s economic transformation process. The Tunisian Government is on the way to design a new development model so as to overcome the pre-revolution economic structures and modalities of policy-making (“Ben Ali legacy”). Based on the HRV (Hausmann/Rodrik/Velasco) decision tree to find out the most binding constraints to growth, the Tunisian government and international experts acknowledge that the “low appropriability” of the returns to private business activity is still the most important barrier causing low levels of investment and employment generation in the country. As “low appropriability” of the returns to investment is caused by many factors (corruption, incoherent economic policies, confiscatory high levels of total tax rates, arbitrary administrative decision-making, lack of competition, advantages of political connectivity, privileges of state-owned enterprises, delays in implementing reforms, and excessive costs of regulation due to oversized bureaucratic structures, etc. ), the task of establishing a new development model is extremely complex. Other factors retarding growth are also considered, such as human capital, infrastructure, innovation, finance, macro and micro risks, but these factors are not considered as binding as the “low appropriability” of private returns to investment factor is. On this basis Professor Karl Wohlmuth discussed the deindustrialization process of Tunisia and the options for reindustrialization, reflecting also on the role of pro-active STI policies for Tunisia (see the full text of synopsis in PDF Wohlmuth-Abstracts and Presentation PDF Wohlmuth-Tunis-2). Although there is an ongoing debate on economic reforms in Tunisia, it is necessary to shorten drastically the extremely long implementation cycle of reform laws from Ministries to Cabinet and Parliament and then back to the Ministries and Implementation Agencies. While the reforms of the Investment Code have started already in 2009 (before the Revolution), up to now only drafts are ready at Ministerial Level, but no decision was made in Cabinet and no parliamentary debate has taken place about an approved draft. Old laws, regulations and procedures prevail. 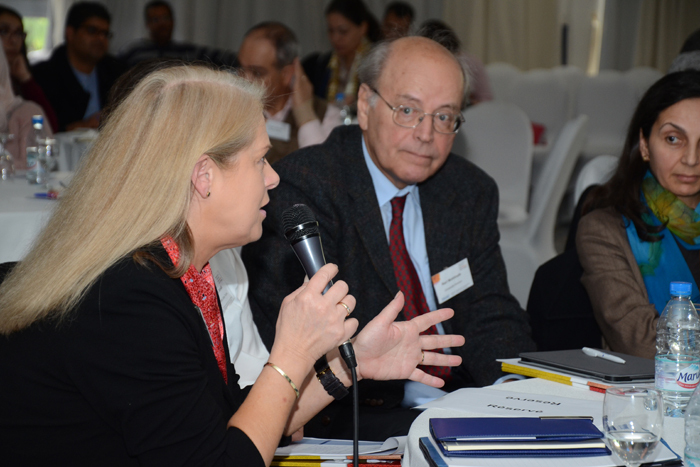 Professor Karl Wohlmuth attended the First German Research Day in Tunis on Tuesday, 16th February 2016 as a panellist. 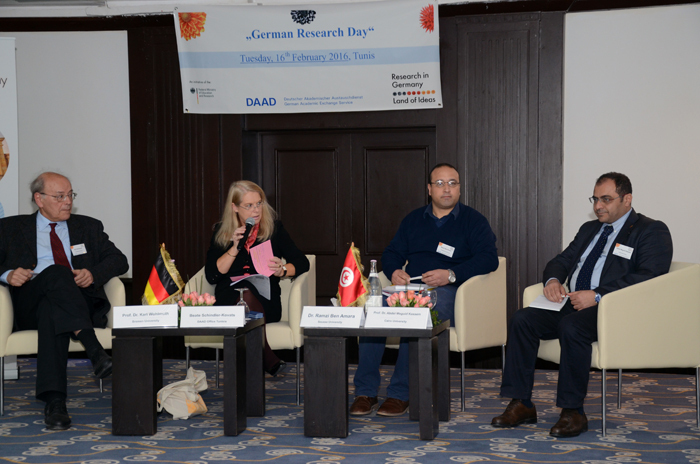 140 Researchers, Officials of Government and PhD Applicants exchanged views during the „First German Research Day“ held in Tunis. 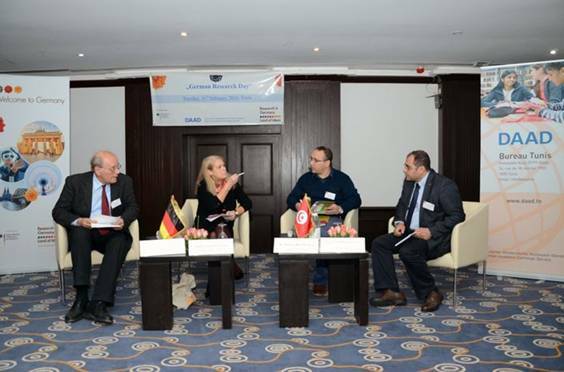 Many Tunisian Researchers, Officials from Government Institutions, PhD Applicants and Representatives from Research Institutions were interested to learn more about how to cooperate with universities, research foundations and research institutions in Germany. 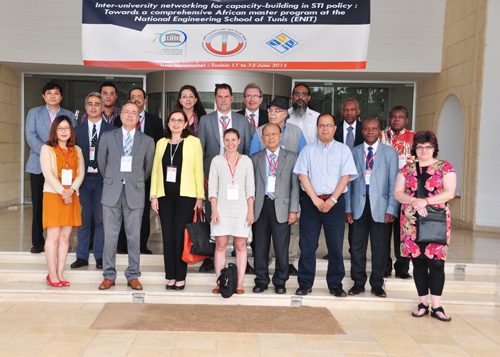 Tunisia has a large number of universities and public research centres, and most of these institutions were represented at the Conference in Tunis. 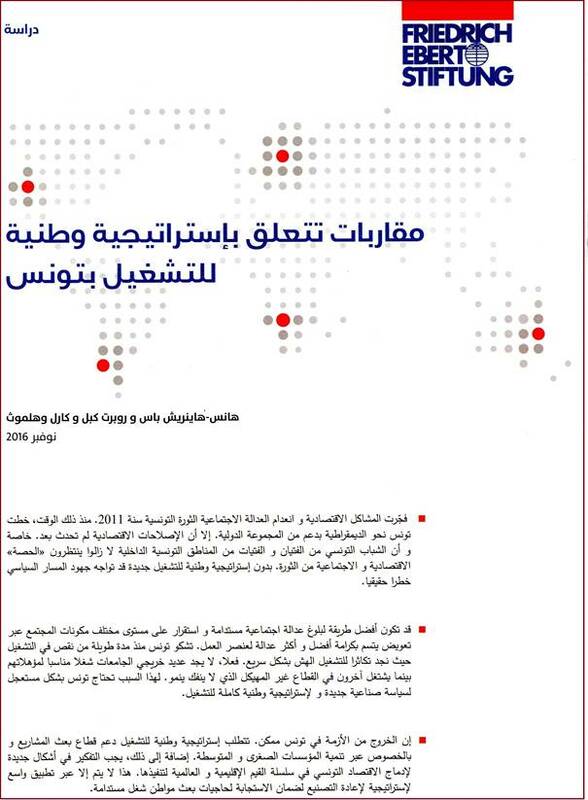 The Arab Knowledge Report 2014 of UNDP gives valuable information on the scientific infrastructure of Tunisia and of other Arab countries (see: http://www.undp.org/content/dam/rbas/report/UNDP-GENERAL-REPORT-ENG.pdf ). The scientific infrastructure of Tunisia is large and diversified, but needs more international exchanges and bridges to domestic and international enterprises. Already Tunisia is associated with the ERA (European Research Area) and Horizon 2020, the EU’s Research and Innovation Programme (see: http://ec.europa.eu/research/iscp/index.cfm?pg=tunisia ). In a Panel Discussion three main issues were discussed: How to find cooperation partners in Germany? How to shape and develop partnership programmes in research and teaching? How to develop multilateral cooperation projects? These issues were discussed by international experts: Professor Karl Wohlmuth, University of Bremen (Germany), Dr. Ramzi Ben Amara, University of Sousse (Tunisia), Professor Abdel Meguid Kassem, Cairo University (Egypt); the Panel was moderated by the Director of the DAAD Office in Tunis, Beate Schindler-Kovats.